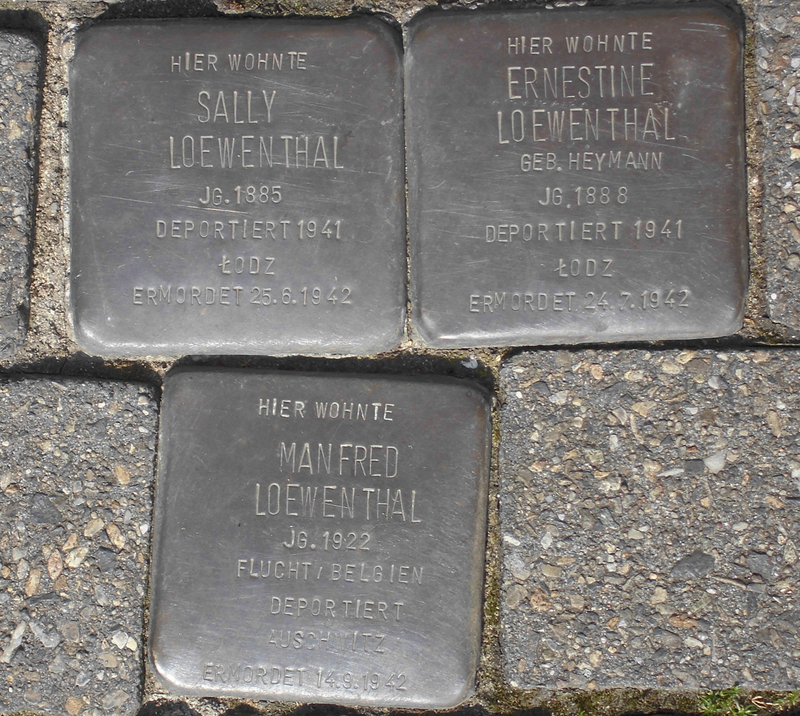 Millions of Jews shared the Loewenthal’s fate during the Nazi period (1933-1945). Ernestine Loewenthal (maiden name: Heymann) was born on 17th March 1888. Her family operated a business selling off-the-peg clothes in the center of Essen-Borbeck. On 27th October 1941, she was deported to Łodz by the Nazis. Nowadays, stumbling blocks remind pedestrians about the family’s period of suffering. The Kultur-Historische Verein Borbeck helped to establish the shimmering stones by means of donations. The stumbling blocks set up in the town center of Borbeck were placed there on 15th November 2005, right in front of the Loewenthal’s former home, forever casting light on the outrageous things happened in Borbeck during the Nazi reign. The other family members were also deported. Ernestine’s husband Sally Loewenthal (born on 18th December 1883) and their son Manfred (born on 7th February 1922) were arrested as well. Sally and Manfred were taken to the concentration camp of Dachau. After escaping from the camp, Manfred returned to Belgium, where he had completed an apprenticeship in former times. From there he was finally deported to the extermination camp of Auschwitz. He was killed in this camp by Nazi thugs on 14th September 1942. Already in the course of the Reichspogromnacht (9th/10th November 1938) Ernestine Loewenthal’s shop had been devastated by Hitler’s supporters. During that night, Jewish shops and organizations were burnt and destroyed all over Germany. Synagogues – like the one in Essen-Steele which also occurs in our geocaching game – were wrecked in the first place by fascist mobs. Many Jewish people perished. This night was a foretaste of what would happen soon after during the Holocaust. Sally Loewenthal was the general manager of the shop ran by the Loewenthals. A woman from Borbeck who was one of Loewenthal’s employees remembered the shop being a horrifying sight after being destroyed by the fascists. The information summarized on this page dates from Ernst Schmidt’s essay Es läuft da eine gewisse Aktion. Die jüdischen Schüler (engl. : „There’s a strange action going on. The Jewish pupils.“) This text was published in Klaus Lindemann’s book Dies Haus, ein Denkmal wahrer Bürgertugend (translated literally: „This house, a monument to true citizin’s virtue“). In addition, another report written by Ernst Schmidt was brought in. Besides, we used the edition Lichter in der Finsternis (engl. : „Lights in the darkness“), likewise written by Schmidt. 2) In general, there a relatively few facts presented by stumbling blocks. Develop – basing on this side – the draft of a commemorative plaque which could later on be placed next to the stumbling blocks. What should be the inscription of such a plaque? Is there probably a hint mentioning the Loewenthal’s fate or does your commemorative plaque point rather to general facts concerning the Holocaust? How about using a phrase drawn from the Old Testament as a principle.